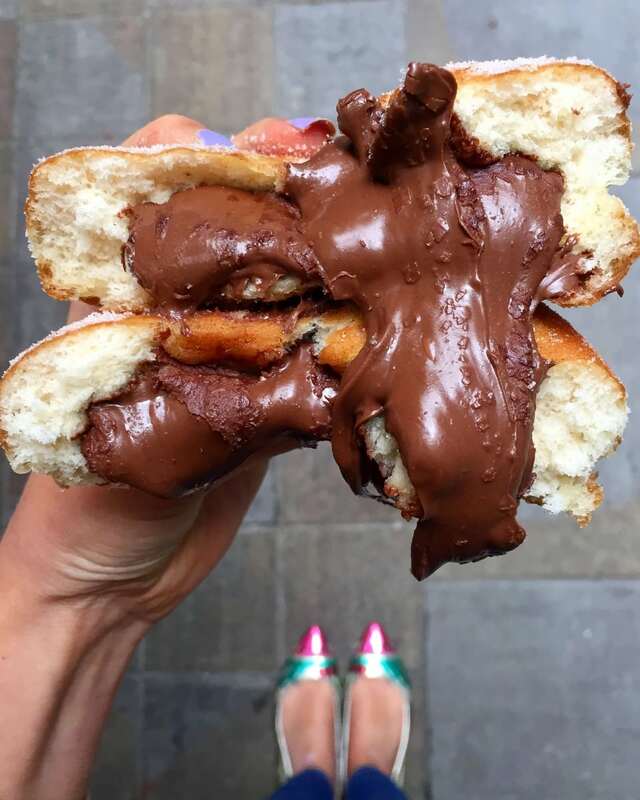 Where To Eat in London if You’re Nutty for Nutella! As a kid I was always obsessed by Nutella. I used to love walking to the corner shop and buying one of those individual packets that came with a plastic spoon! Remember those? I begged my mum to buy it at the supermarket but sadly she wouldn’t. Now I’m a fully fledged adult (debatable) I can enjoy it anytime I like (woohoo). London has got so many creative options when it comes to enjoying Nutella which means I don’t have to sit with the jar and spoon, even though that is *totally* still an option. From cookies to cronuts, milkshakes to muffnuts (you’ll see! 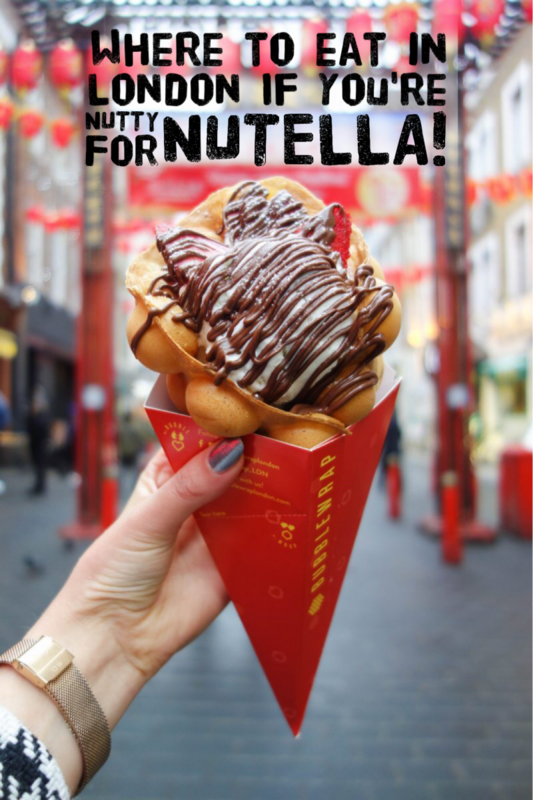 ), here are 26 places to visit in London if you’re nutty for Nutella – and you need to visit them ALL! 1. Cronutella, Dum Dum Doughnuts. 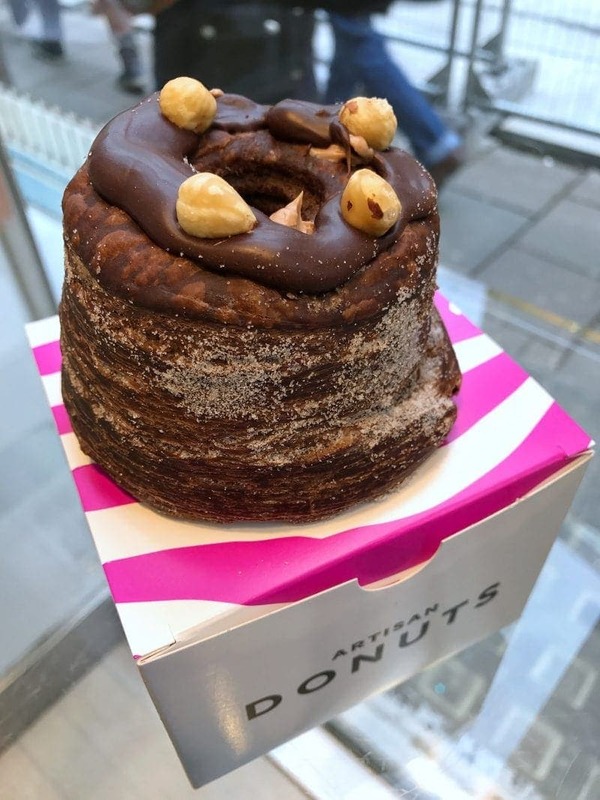 When a doughnut meets a croissant and you stuff it with Nutella the ‘cronutella is born’. You can find them at Dum Dum Donuteries across London. 2. Nutella Naan Bread, Spitalfields Market. If you like Indian food and you like Nutella then you need this in your life. 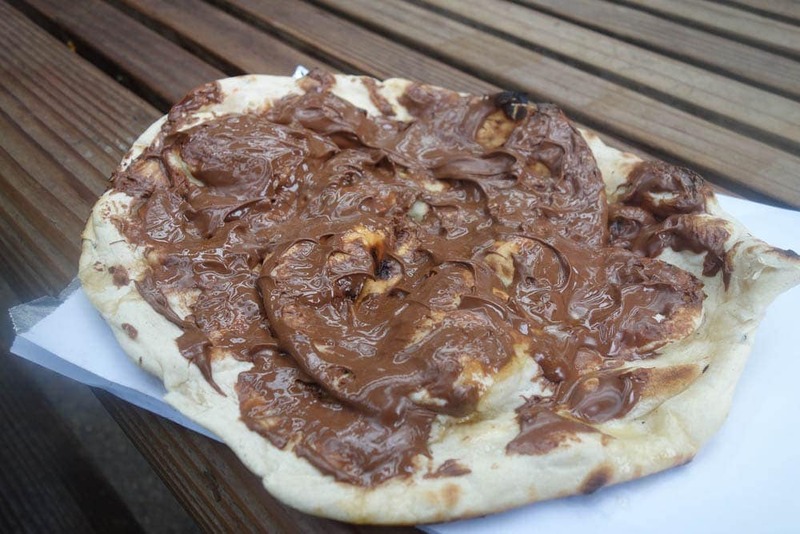 Head to East London’s Spitalfields Market and grab one of Scarlet Grills Nutella Naan bread. They cook the naan fresh in front of you, brush it with butter and slather it in copious amounts of Nutella. 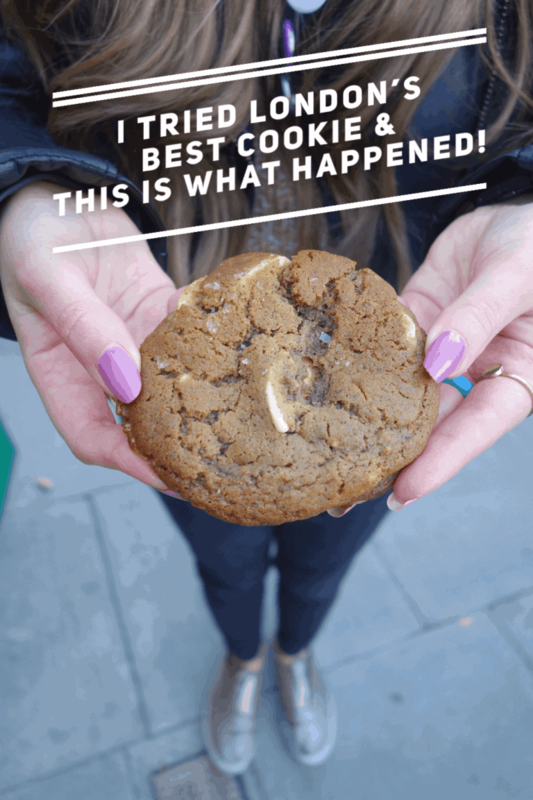 You’ll also find it on my Ridiculously Indulgent Things You Must Eat In London List. 3. Nutella Banana Bread, Cafe Miami. 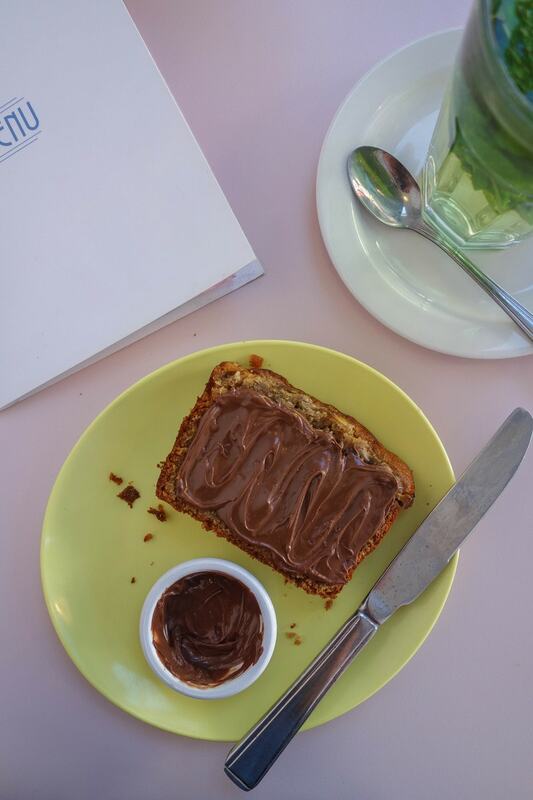 Banana bread and Nutella is a match made in heaven, is it not? 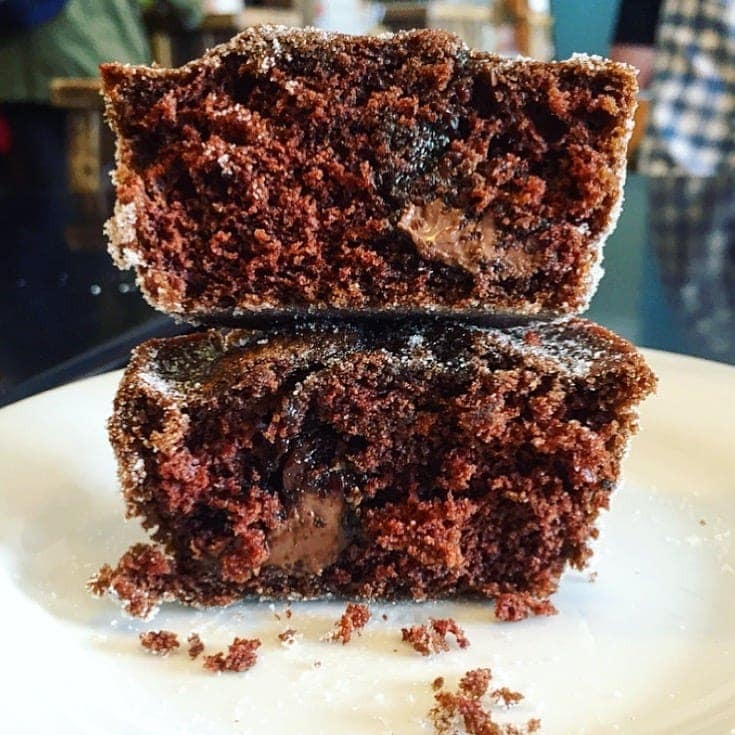 At gorgeous retro cafe, Cafe Miami in East London you can devour their homemade Banana bread for breakfast along with their Nutella pancakes and Nutella filled cookies. They have all our Nutella cravings covered and we couldn’t love them more for it. 4. Love at First Bite, Doughnut Time. Looks are deceiving with Doughnut Time’s Love at First Bite doughnut. Crack it open and you have NEVER seen so much Nutella in one doughnut. 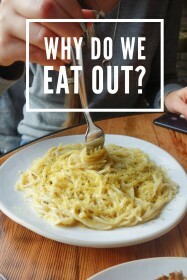 It really is love at first bite! 5. Nutella & Banana Spring Rolls, Zing Zing Chinese. 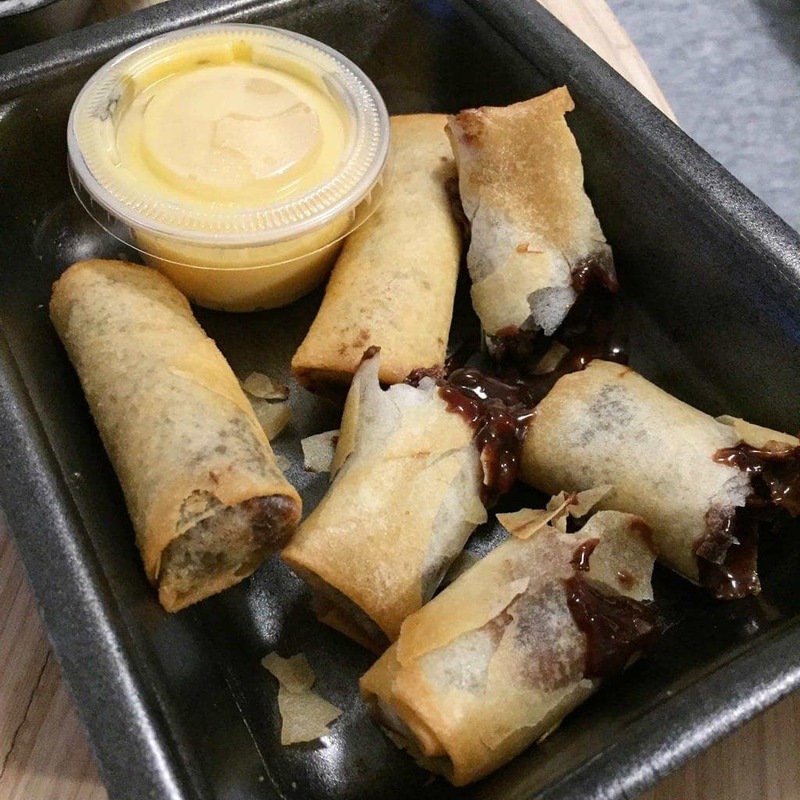 When Chinese takeaway meets dessert you get a Nutella spring roll. Available from Zing Zing Chinese; a MSG-free Chinese takeaway with locations across London. Over the last year Bubblewrap has become one of the most talked about and photographed desserts in London. 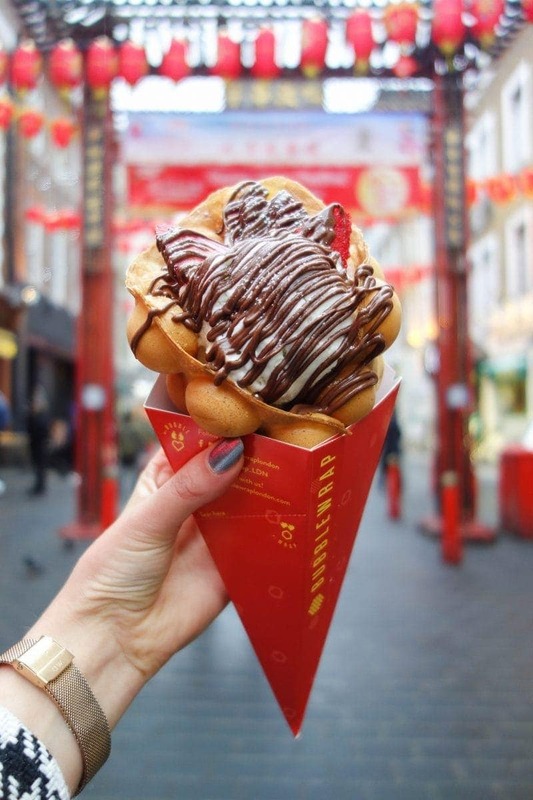 Their fluffy waffles are cooked fresh and stuffed with ice cream, fruit and drizzled with Nutella making it an Instagrammers dream! 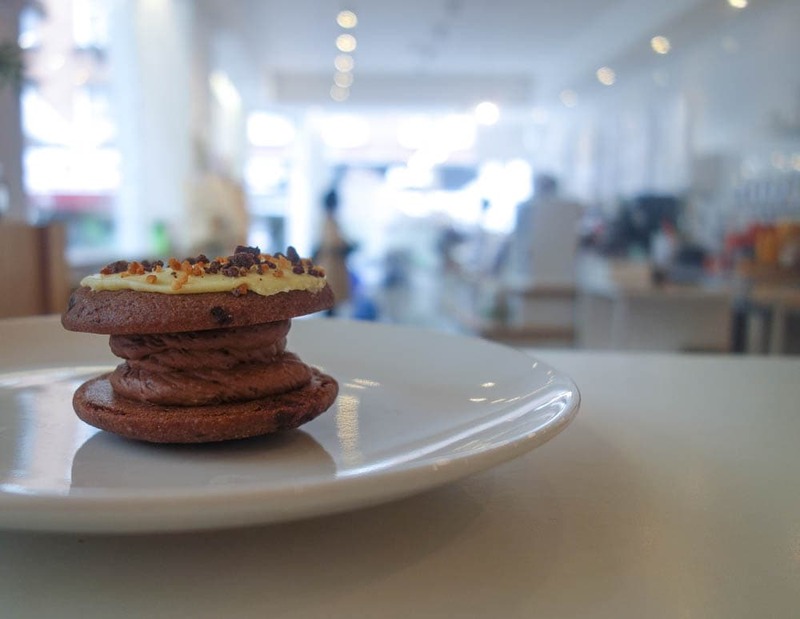 Find them on my Drool Worthy Dessert Spots in Chinatown post. 7. Build your own Pancakes, Christopher’s. 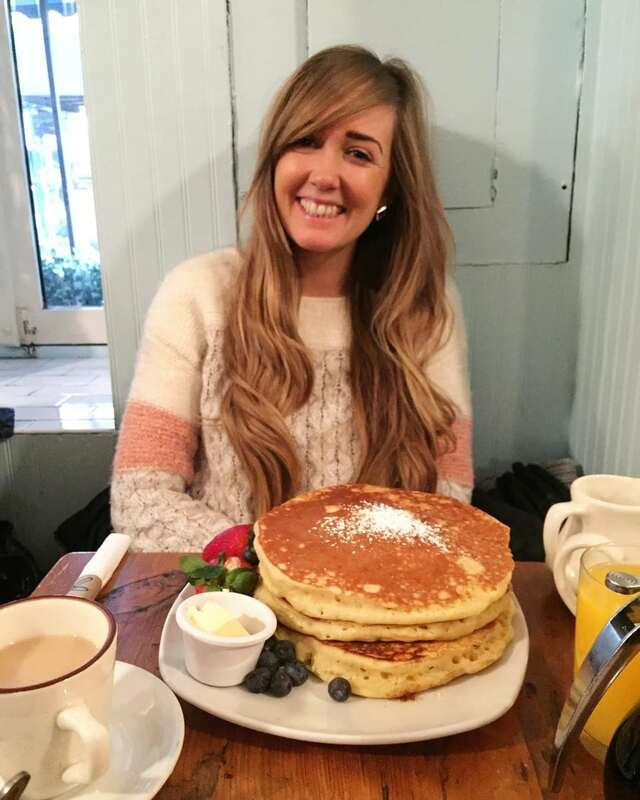 Christopher’s in Covent Garden do ‘build your own pancakes’ as part of their amazing brunch menu. 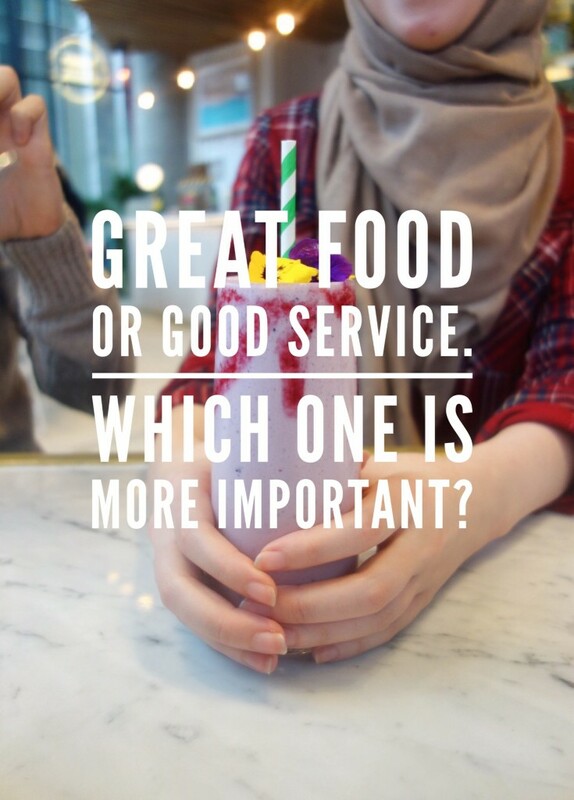 Nutella is on the list and of course, it’s a very obvious choice. 8. Nutella and Mascarpone Pizza Ring, Pizza Union. Possibly my favourite pizza place in London, Pizza Union not only do great pizzas but they have created the ultimate dessert to finish on. 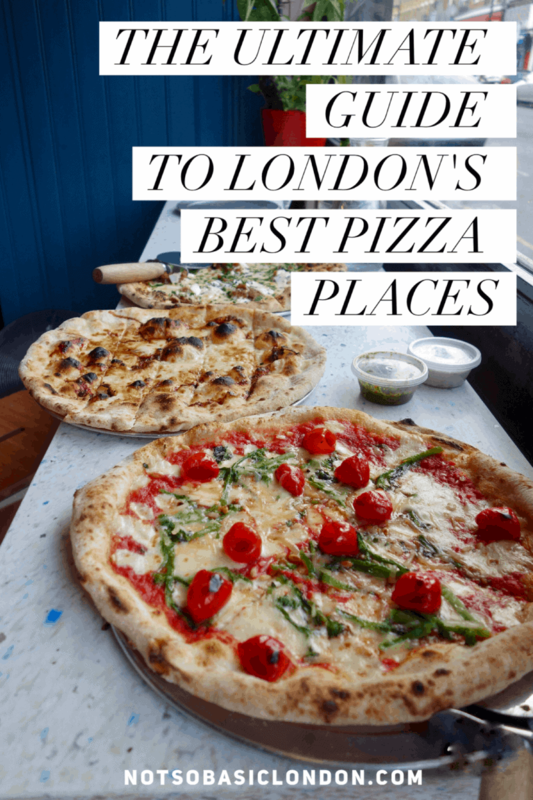 Their pizza ring filled with oozing Nutella, mascarpone and is crispy on the outside and hot and gooey on the inside. Click on the picture below to play video. 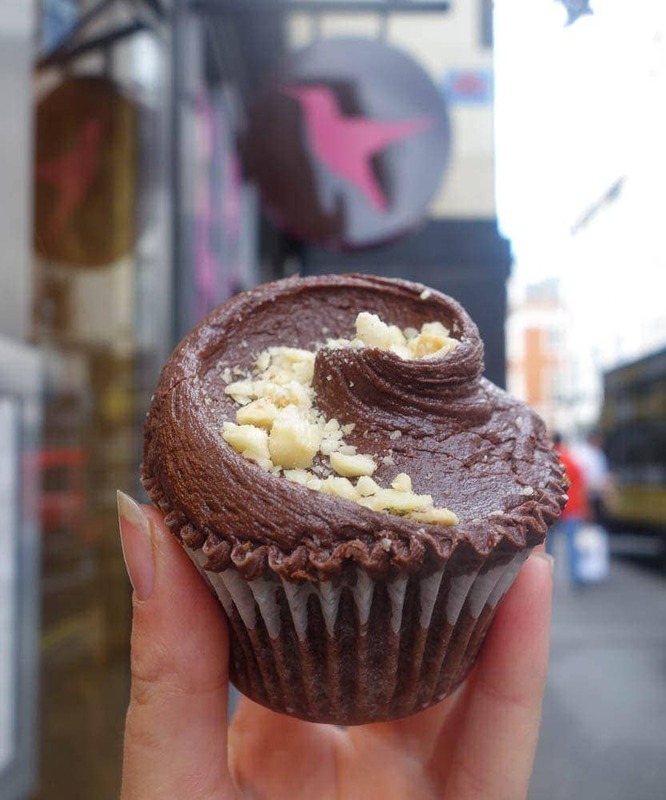 The famous Hummingbird Bakery has created an epic Nutella cupcake for serious Nutella addicts. It’s got a Nutella sponge, Nutella frosting and an oozing Nutella core! Enough Nutella for you? 10. Nutella and Cinnamon Brioche, Cut The Mustard Cafe. Cut The Mustard are a local, neighbourhood cafe and bakery. 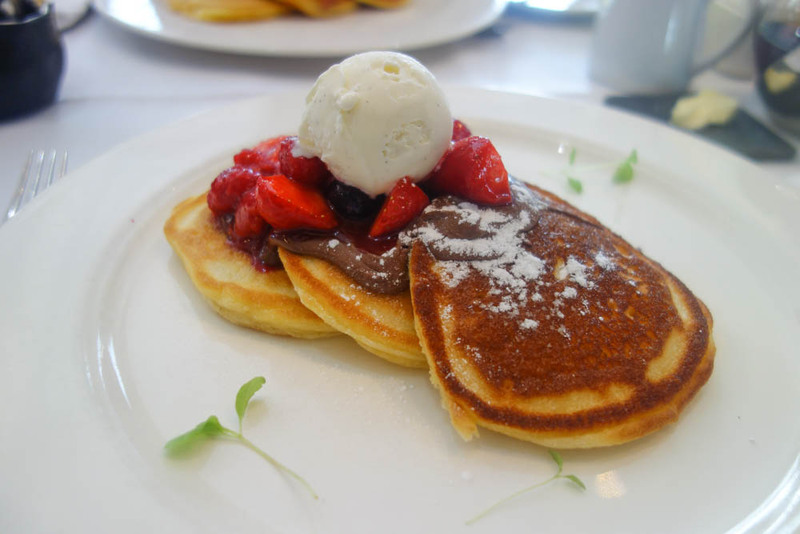 They do a fantastic brunch plus lots of freshly baked goods including their Nutella and cinnamon brioche. Get breakfast and then have one of these for bressert … that’s breakfast dessert if you haven’t heard of it. 11. 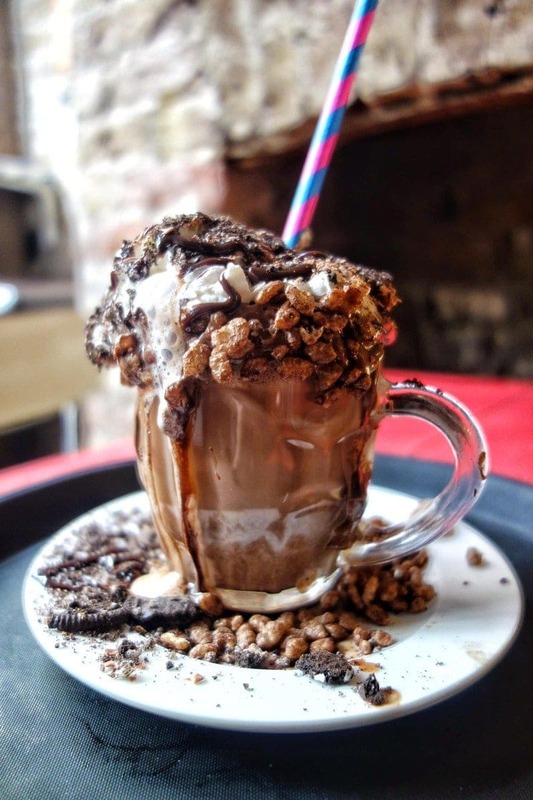 Nutella Stacked Hot Chocolate, Cereal Killer Cafe. The Cereal Killer Cafe doesn’t JUST do bowls of cereal you know! 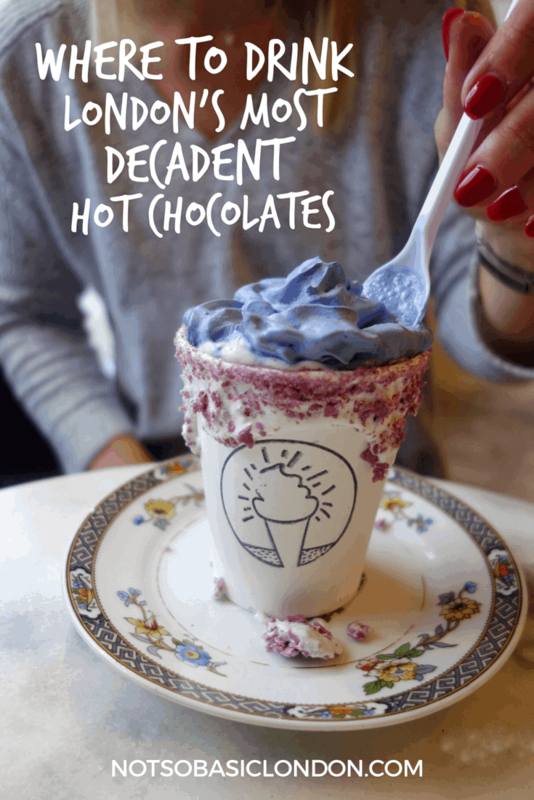 Head there for their epic stacked hot chocolate complete with Nutella, Oreos and lots of cream! 12. Nutella Sfogliatelle, The Coffee Tree. The Coffee Tree is a little gem just off Covent Garden. Their sfogliatelle is a crisp, layered Italian pastry packed full of Nutella. Put the sound up on the video below to hear how amazingly crisp this is! 13. Nutella and Sea Salt Cookie, Megan’s. 14. Nutella Bagel, Beigel Bake. 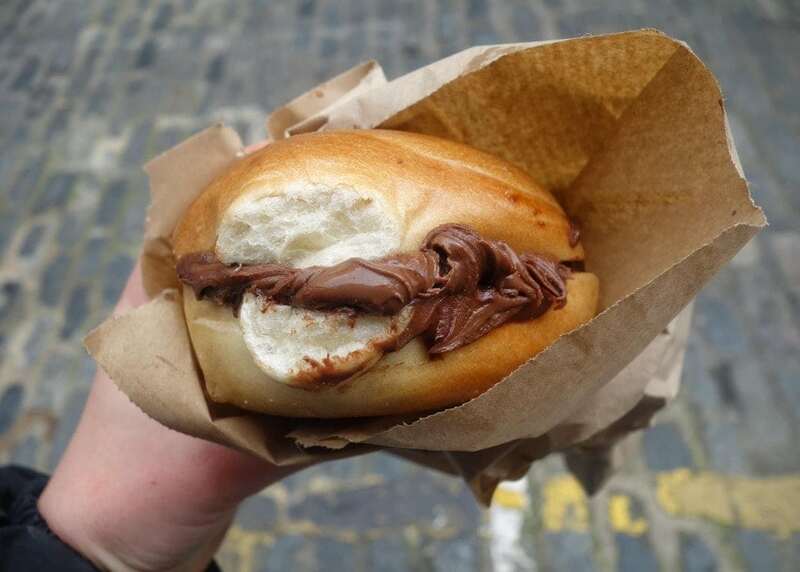 Beigel bake are famous for their salt beef bagels but what you might not know is they also do a Nutella version too. Their perfectly chewy bagels are baked fresh in-house every day and packed with Nutella. For just £1 it’s an absolute bargain! 15. Canelé by Babelle, Fortum and Masons. Nutella works in ANYTHING, even when you put it together in delicate French patisserie. The Nutella canelé has a crispy, caramelised outside, and a soft, custard, Nutella filled inside. Click to play video. 16. Nutella Muffnut, Coffee In The Wood. For those who like quaint coffee shops, cakes and funny words you’ll want to take a trip to Coffee In The Woods. Their muffnuts (yes, muffnuts) are a combination of a muffin and doughnut filled with Nutella and rolled in sugar. Great name, great treat. 17. 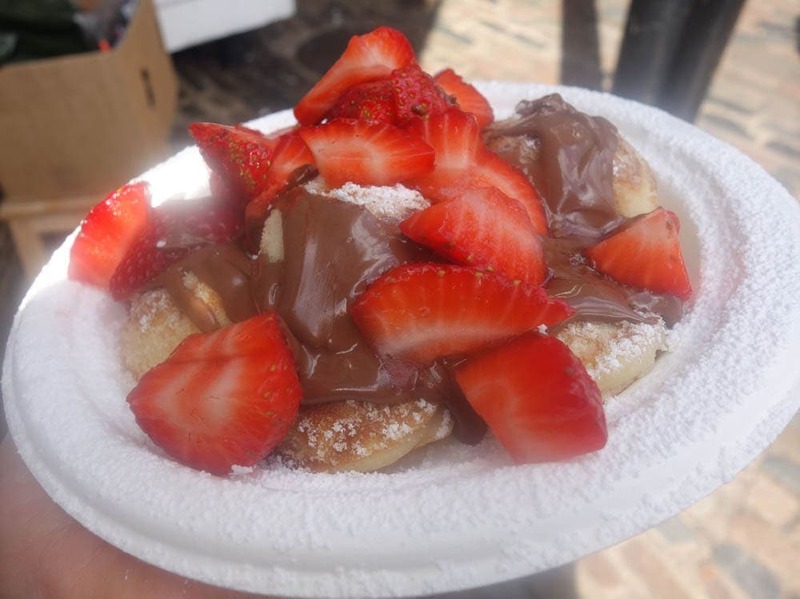 Nutella and Strawberry Pjorferes (Mini Dutch Pancakes), Camden Market. 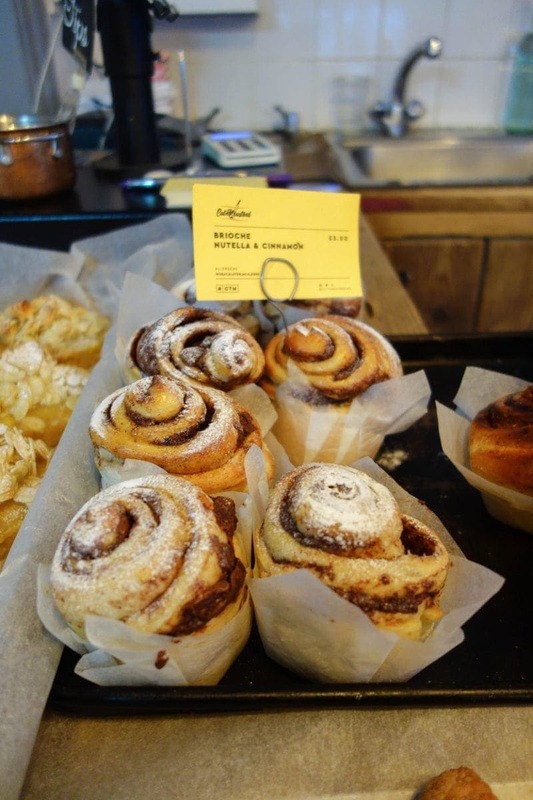 Once you’ve got your savoury fix at Camden Market head here for your dessert. These indulgent pjorferes (mini dutch pancakes) are smothered in Nutella and topped with strawberries. Find them on my Where To Eat London’s Tastiest Pancakes blog. 18. Oat and Nutella Cookie, Starbucks. 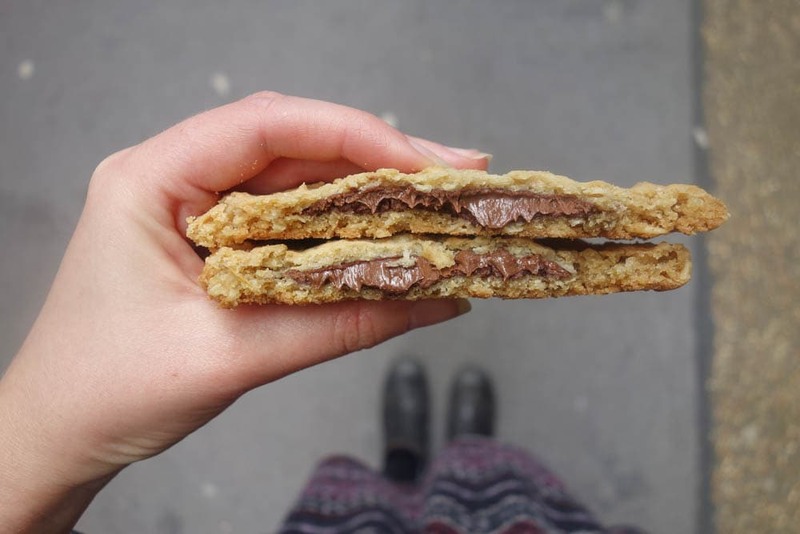 Grab a coffee and Nutella cookie at worldwide coffee chain Starbucks for your morning brekkie or midday treat. 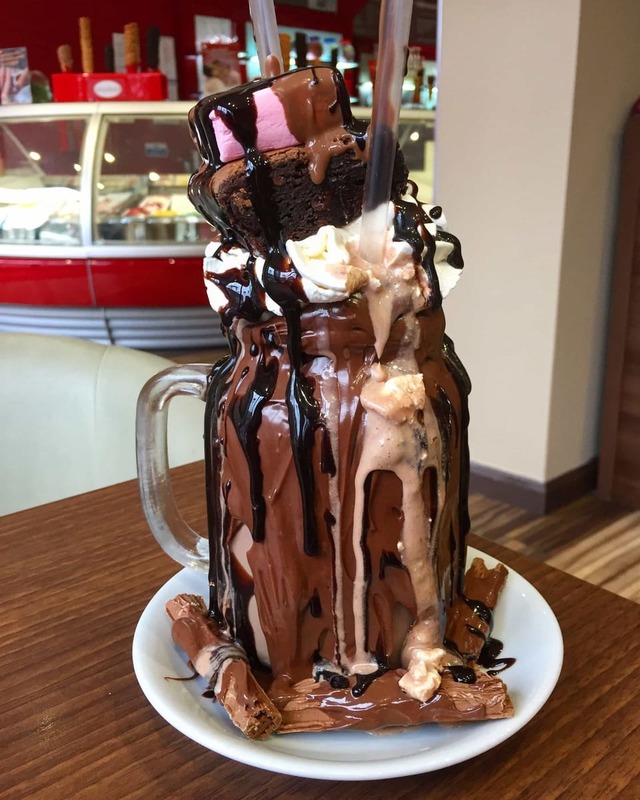 The milkshake at Sensations dessert bar is so epic they call it a Freakshake. This decadent drink is topped with Nutella ice cream, whipped cream, brownies and marshmallows. If that wasn’t enough the whole thing is dipped in Nutella too. ABSOLUTELY INSANE. 20. Nutella Duffin, Beas of Bloomsbury. 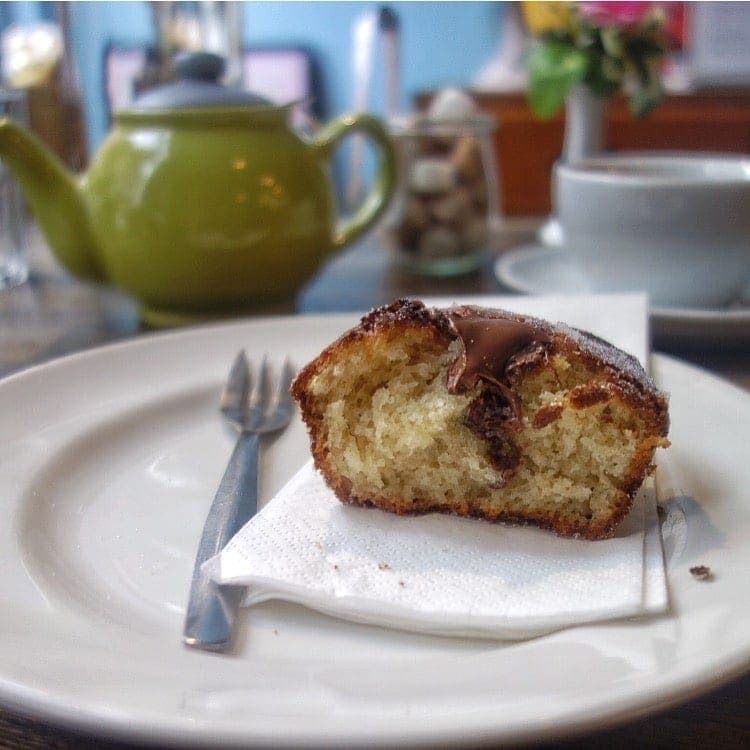 Beas of Bloomsbury were the first people to create the duffin – a muffin and doughnut hybrid stuffed with Nutella and rolled in sugar. It’s caused some outrage in London over who created it first and if you don’t believe me go and Google ‘duffingate’ and you’ll see what I mean. 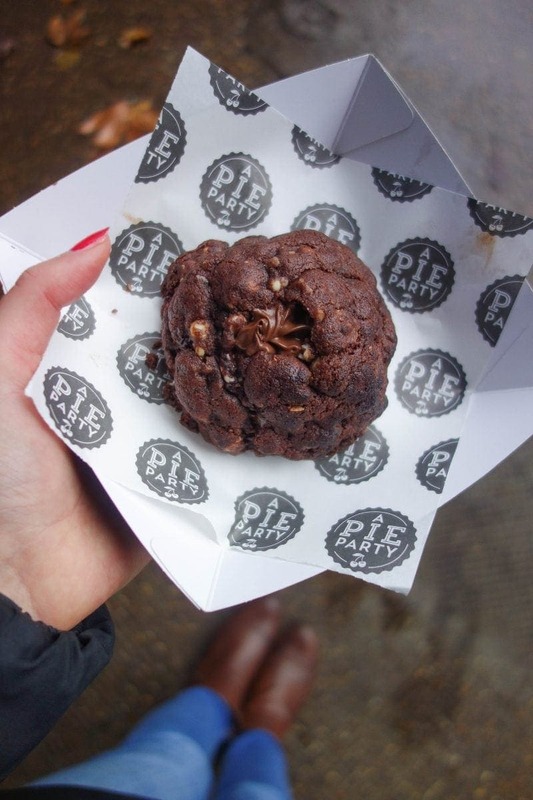 The giant chocolate cookie from ‘A Pie Party’ is crispy on the outside and soft and gooey on the inside. It’s loaded with crunchy nuts, a touch of salt and filled with a whole heap of oozing Nutella. This place also made it to my ‘Must Eat’s on 2019‘ list. 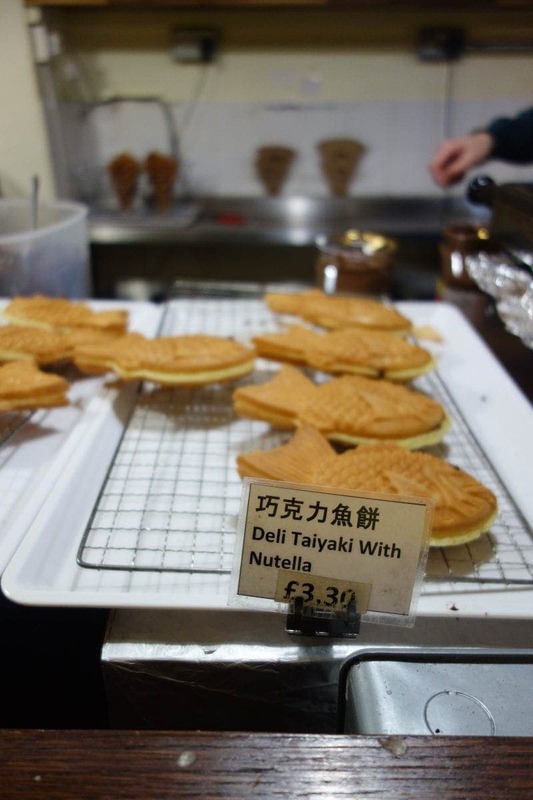 At Chinatown’s most popular bakery and you won’t want to miss their Nutella filled Taiyaki. The best part is that you can watch them being freshly made by hand and can often grab one piping hot and gooey! 23. Nutella Biskie, Cutter and Squidge. What do you call a biscuit, cake and brownie all in one? A biskie, of course! 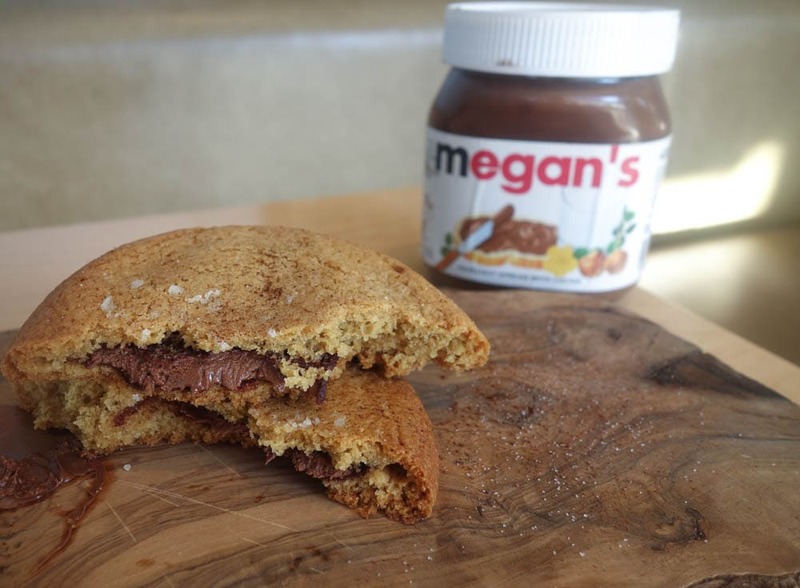 Created by and exclusive to cafe Cutter and Squidge, they’ve created a Nutella version and it’s the perfect little Nutella treat. 24. 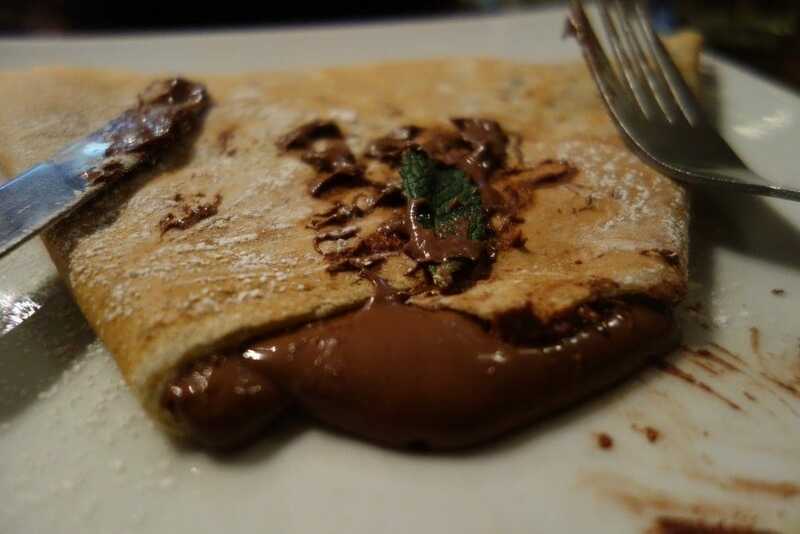 Nutella Crepe, Senzala Creperie. Crepes and Nutella are a match made in heaven, aren’t they? Senzala have a great menu of sweet and savoury crepes so get something for dinner and have this for dessert. Remember pancakes are for life not just for pancake day! 25. Nutella Cheesecake Brownie, Outsider Tart. 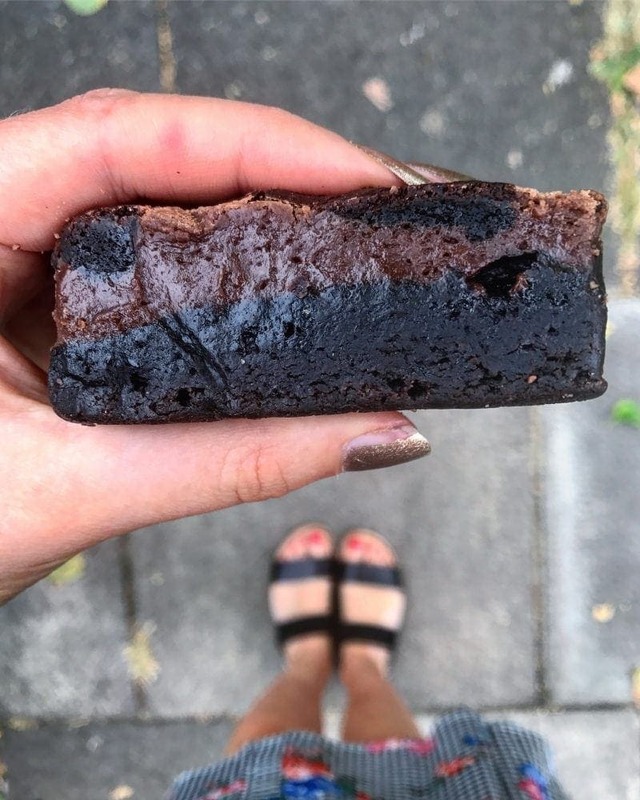 Outsider Tart is an authentic American restaurant and cafe in West London and they’ve got the biggest and best collection of brownies you’ll ever see. The Nutella cheesecake is one of many flavours they have and it’s not for the faint hearted. 26. 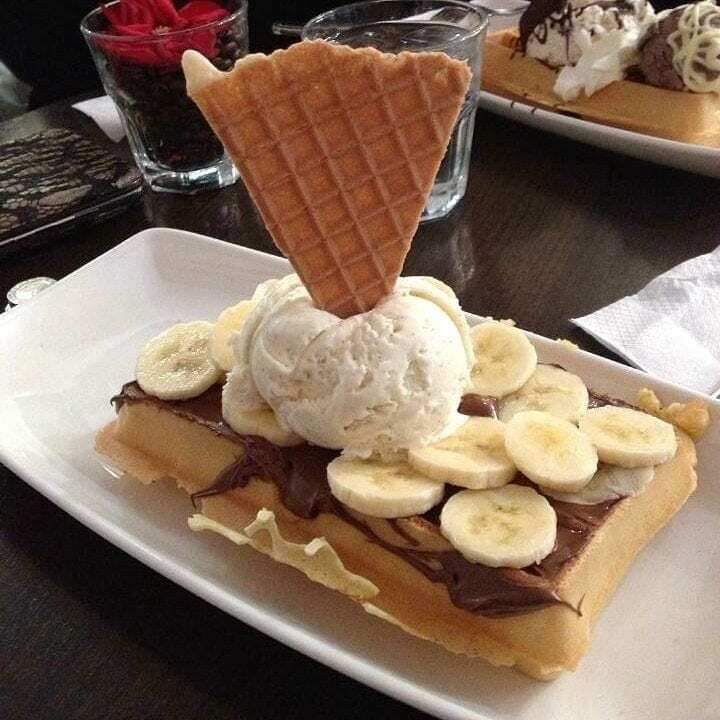 Nutella and Banana Waffle, Kula Cafe. A great dessert cafe just off Oxford Street. The waffles at Kula cafe are hot, fluffy and slathered in a thick layer of Nutella. What more do you need in life. I am ashamed to say that I haven’t tried nearly enough of these!! I really really love nute lla to bits okay. Poffertjes that’s how you spell it! You pronounce it like you spell it, but the O like a long ooo.